This plugin is an add-on that builds a bridge between the wpDataTables plugin which renders awesome interactive responsive tables and charts and Gravity Forms advanced form builder. The form entries will be rendered as rows, form fields will be treated as columns. 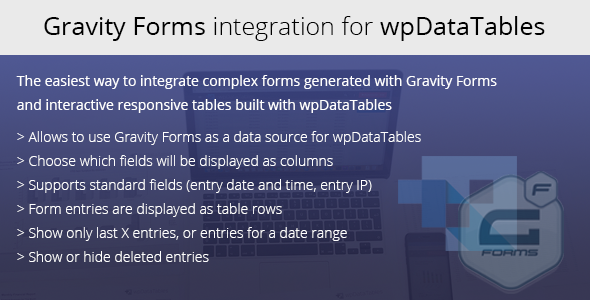 When you activate it, you will have one more data source in the wpDataTables’ table creation wizard – Gravity Form. Please note that only forms that do have 1 or more entries can be rendered in a table. See the documentation and tutorial on using the addon on this link. Choose which fields to display as columns – the table creation wizard will show all the form fields, it’s up to you to choose which ones to show in your table. Toggle deleted entries – you can define whether you want to include the deleted entries as well. Use all of wpDataTables power – once you create the table you can work with it as with all wpDataTables – make it responsive, add formula columns, render charts, etc. This addon is implemented by wpDataTables’ authors, TMS-Plugins. If you need help with it, please use our support site – https://tmsplugins.ticksy.com/ – Gravity Forms authors will not be able to provide support for this addon. For using this add-on you need to have FULL versions of wpDataTables and Gravity Forms installed on your website!